Last year a new member joined my flying club, Leading Edge Flying Club, and brought with him a 2004 Sky Arrow 650 TNS to expand our fleet. I was immediately intrigued by this aircraft the first time I saw it. It was unlike anything in our fleet or that I had seen as a rental at our airport. 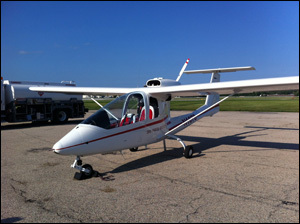 This tandem seat 98 horse power pusher aircraft looks like a light sport aircraft, but this particular model is not an LSA. Every member of the club that has flown this plane since it arrived has raved about the experience saying how much fun it is to fly. I planned a dual purpose mission for my first experience in the Sky Arrow. When I used to be a Cessna driver one of my favorite things to do was to open the window and hang my camera out the window to shot some aerial photography. Lately, I have been logging most my time in a Piper Archer III and a Piper Dakota which give limited access to canopy-glare-free shooting. I learned that the Sky Arrow has rear windows that could be completely removed. So I asked an instructor to take me up and circle a few points of interest while I shot unobstructed from the back then we could land switch seats and work towards a check-out in the aircraft. The minute we started taxing I realized I was in love with this aircraft. There was something fun and nostalgic about taxiing with the canopy open, wind blowing in our hair and the fresh smells of the airport wafting into the cockpit. On the takeoff roll as you are sitting so much lower to the ground you get a better sense of speed which is also thrilling. However, that is the last time in the flight you will have a sense of high speeds. The plane is perfect for low and slow flying which is ideal for photo adventures or city skyline tours. Al showed off the aircraft performance circling over my target while I enjoyed leaning out the window taking photos. Then I flew him over The Ravinia Festival to check out the show from above. When we returned to Chicago Executive he suggested I make the landing. However, from the back seat you have no gauges and limited to no view of the gauges in the front. So I had to do the landing by feeling. What a refreshing feeling that was. I think I have grown to accustom to all the benefits of a glass cockpit that sometimes I don't just fly the airplane enough. When I moved to the front seat I fully realized that this is a perfect airplane to reconnect a pilot with their stick and rudder skills. There is no auto-pilot and if you don't use your rudders the ride won't be smooth or comfortable. Flying the Archer or Dakota it is easy to let some of your core skills diminish. The plane is fun too because it is utterly simple. Although, it has a glass panel there is not much to flying it and has the quickest pre-flight run-up of any aircraft I have flown. I logged 1.6 hours in the Sky Arrow and need to go back out to do some of the basic maneuvers before I check out but look forward to taking advantage of this fun aircraft this summer. The video below is my first take-off from the front seat of the Sky Arrow near sunset. Hello I'am looking for an Sky Arrow for sale, prefferely a 600/650T with Permit to Fly LAA. If you know a Pilot that is open for selling his Sky Arrow I'am interrested.